Dr. Michael Fuller visited Deir Mar Musa al-Habashi (the Monastery of Saint Moses the Ethiopian) situated near Nabk, Syria (between Damascus and Homs) on 1 June 2004. Previously, he has visited on the monastery on on 25 May 2001 and once during the summer of 2000. He was accompanied to the monastery in 2004 by Edward and Romeo, Syriac speaking members of the Assuri (Church of the East) community in Hasake. Professor Michael Fuller (far right) enjoys lunch with the visitors to the Monastery of Mar Musa. Seated to his right is an accountant visiting from Greece and next to him is Romeo Nanoo. Click Here to see the beautiful Medieval Paintings inside of the apse of the Deir Mar Musa church. Click Here to see the beautiful Medieval Paintings inside of the nave of the Deir Mar Musa church. Click Here to see the Medieval Paintings of heaven and hell on the west wall of the Deir Mar Musa church. Click here to see images of Medieval artifacts discovered during the restoration of the monastery. Click here to see the official Mar Musa webpage. Lunch was prepared by Abou Riyad. The main dish of the lunch was egg scrambled with squash. The second dish for the lunch was fried eggplant and onions. The lunch also included cucumbers, tomatoes and bread. Lunch was served at 3 PM. View of the monastery with the sunshade were lunch was served. Mar Musa with Medieval building on the left side and the modern portion (ca. 1990s to present) on the right side. Medieval doorway into the monastery. Doorway from the entrance room into the monastery courtyard. 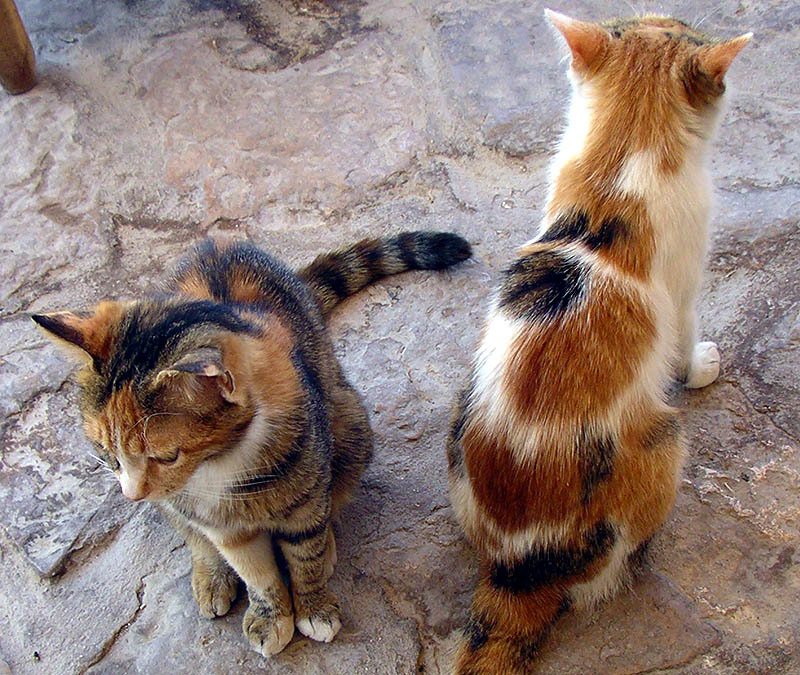 I photographed two cats on the monastery porch during 2004. In 2001, the monastery included 72 goats, 1 mule, 1 donkey, 4 dogs, dozens of chickens, and bees. The goat milk is used to make small disks (ca. 15 cm.) of delicious cheese. The monks do not intentionally kill any of the goats or chickens, but they do cook and eat animals that die from falls or accidents. The monastery owned significant parcels of land in the areas of Nabke, Maloula, and in the Beqka valle of Lebanon during the 15th century. It was abandoned in 1831 when the Syrian Orthodox Church lost control of the churches and monasteries in the Nabke area. It became a hideout for bandits after abandonment. The monstery came to the attention of Father Paolo Dall'Oglio, a Jesuit priest, during 1982. He began to reoccupy the monastery and oversee its restoration in 1984. Mar Musa turtle, no kidding! Outer walls of the monsatery. An ektachrome slide taken in 2001 and digitized by Prof. David Hanlon (Art Dept. of STLCC-MC). 2001 The Frescoes of Mar Musa al-Habashi: A study in Medieval Painting in Syria. Pontifical Institute of Medieval Studies, Toronto. 1998 Il Restauro del Monastero di San Mose' L'Abissino, Nebek, Syria.